Another month and another big rash of orange and black as the boys and girls of Team TORQ get into action throughout the country as the XC & enduro season gets well under way. 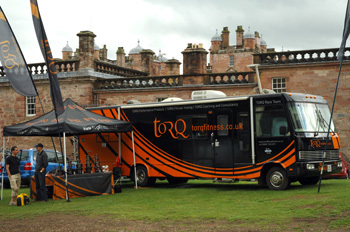 Round 2 of the XC National Points Series headed for the Scottish Borders and pitched up at Drumlanrig for a cracking couple of races. With the dramatic backdrop of the fabulous Jacobean castle riders lined up to get ready to tackle one of the most technical courses used on a NPS circuit for many years. 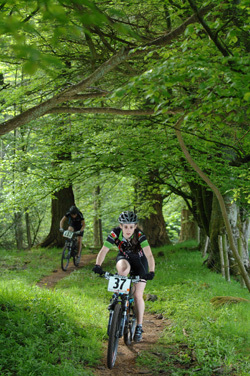 Course designer Rik Allsop has over the years crafted a superb network of natural trails that thread themselves for miles around the grounds of Drumlanrig and a crafty 7.5km loop including rock gardens and plenty of rooty action was highlighted for the XC riders to fight their battles round. A nasty breath taking climb just meters from the start, was just the beginning of the testing circuit, masses of dry dusty tricky singletrack lay in wait and the main plan for many competitors was to hit the singletrack sections first to gain an advantage over their rivals, as the twisty, rooty sections left no room for manoeuvre. The elite riders were out en mass as this round was classified as a UCI Cat 2 race and so plenty of UCI points were up for grabs. Fresh back from an intensive couple of weeks of World Cup races was UK’s no. 1 Oli Beckingsale, keen to put his recent form to good use and show the rest of the field why he is number one. 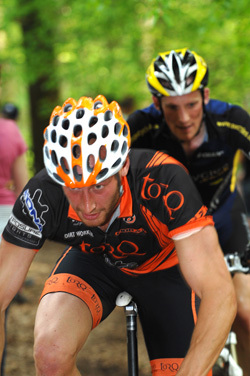 Hoping to get into the thick of the Elite action were TORQ riders, Ryan Sherlock, Nick Collins and Matt Loake. 2 crashes in the first lap paid to any contention by Ryan and he limped home in 19th spot, just behind Nick in 18th. 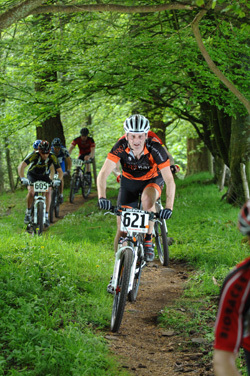 Matt rode well in his first season as an Elite rider to come home in the top 30 in a tough field. Mel Spath had great hopes in the Elite women’s race to get another spot on the podium after a cracking 2nd spot at the last NPS, unfortunately a bad start, leaving her behind piles of slower riders saw any chance of a podium rapidly disappear. Despite a real good effort Mel had to settle for a disappointing 5th. 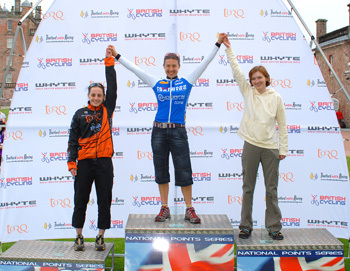 TORQ presence on the podium was upheld by Master racer Emma Bradley who picked up a fine 3rd and with it her first visit to the NPS podium. 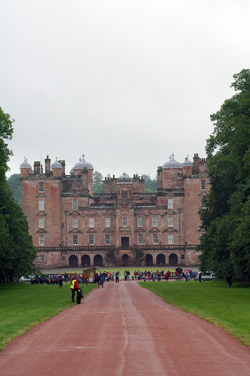 After a good night sleep, despite some ominous thundering in the night and a few light tinkles, riders turned up at the stunning setting of Drumlanrig Castle once more to this time do battle over a 12.5 km course that linked parts of the XC course from the previous day with some new unexplored sections of the estate. Riders could look forward to lots of singletrack snaking its way through alternating copses of Beech and pine, which provided some much needed shelter from the unrelenting heat. If the riders could have ridden at less than break neck speed I’m sure they would have admired the beautiful setting they found themselves competing in. However this was an all guns blazing day, with plenty to be proved around a pretty gruelling course. 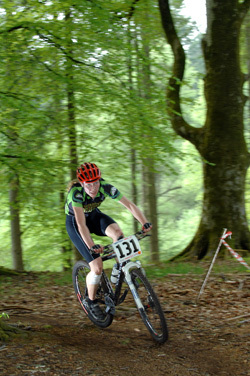 Mel spent little time asserting herself in the 100km, hoping to do a much better ride than in the XC. She attacked on the 2nd lap and got away, settling into a steady rhythm for the long race. 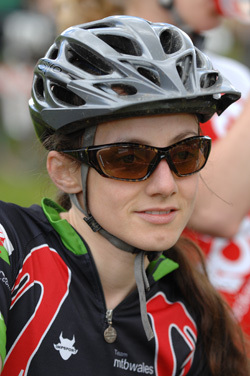 However by lap 4 main rival Sally Bigham had caught and passed Mel, leaving her to settle for 2nd. 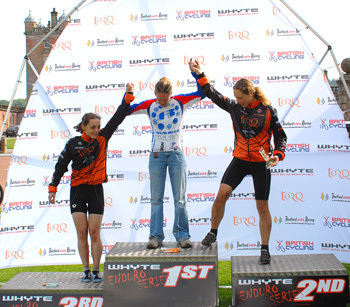 Making a good orange and black splash on the podium Mel was joined by TORQ team mate Emma Bradley who continued a cracking weekend with 3rd in the 100km. Mel and Emma are shown the way to the top step, won’t be long before they find their own way there! I had a better ride today than yesterday. Yesterday I just had a crap start I was on the start line with my bottle in my hand when the race started, so that was a stupid mistake. So today was much better, the weather was much drier not so humid, so you just felt better getting around the course. I liked the course it was very nice but it was tough on a hard tail, it would have been better on a full suss. I can barely bend down now my back is in bits. This is a medium technical course to what we have in Ireland as it’s a course you can ride all of, in Ireland you have more technical courses with you have to dab a number of times. I rode with sally for a lap then tried to get away in the singletrack as I had an advantage y riding the course yesterday, I got away but she got back to me and she had the power to go and once she knew the course she rode it a lot better. That’s the longest spin on a mountain bike I’ve ever done… It’s so hard on your body, but I love it, especially when the courses are so interesting like this. A very good weekend for me 3rd yesterday, which still hasn’t sunk in, so it’s been a cracking weekend. I was having so much fun in the race yesterday, sliding my back wheel round the corners and I was just having fun and doing my best which I did and got my first ever podium in a NPS, so it was ace. I was really tired today, my legs were fine but I was physically quite tired so the idea was to go out steady and try and maintain it. I have to thanks 2 men I guess Matt Hart my coach and of course Rob my other half, he picks me up after races and sorts my bike out and puts up with me. Ryan too had a much better ride than the previous day coming home in 4th just missing out on a visit to the podium. 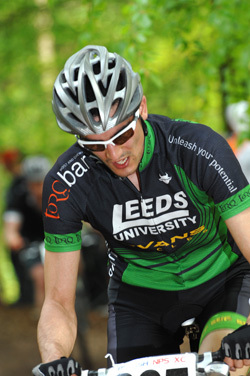 Meanwhile it was good to see Jeff Spetch and Martin Evans out on course giving it their all. 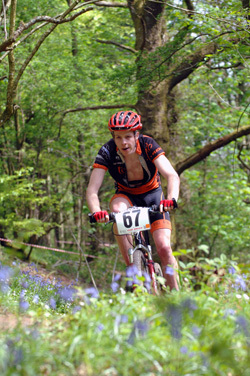 Jeff picked up 9th in the 75km, while Martin took a respectable 5th in the vets 50km. Ryan having a better day! 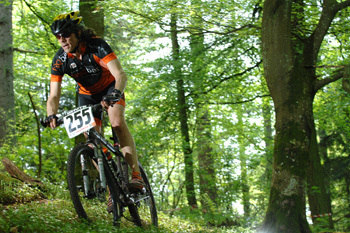 2008 as seen a real explosion of enduro events on the racing calendar, the latest newbie on the block was Set2Rise a dinky 12hr set in the midst of Salisbury Plain and of course Team TORQ were in attendance, with some great results. James Lister was looking good for a win in the solo category; unfortunately he had to abandon suffering from chest pains. 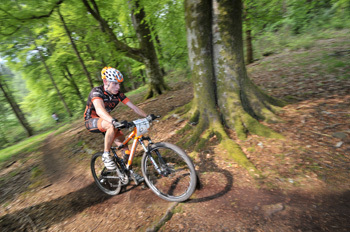 Team mate Charles Newton –mason however went to pick up a cracking 3rd. But it was the teams of 4 that saw Torq rule supreme, with an orange and black rash on the podium as Torq1 and Torq 2 filled the top two spots! Next it was down South for a visit to the Gorrick stable of races. 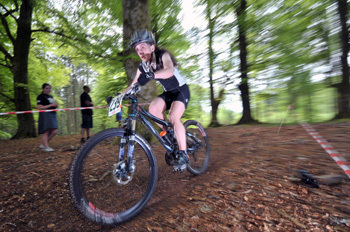 This time it was their classic 100km enduro that drew the crowds. An inviting 14km loop lay ahead and with plenty of TORQ riders in action it was to prove to be a grand day out! Viv Hazelton took the honours in the women’s 7lap race with a fine 1st, with Charles Newton-mason picking up 9th in the men’s 7 lapper. In the 5 lap race Torq sponsored rider Ross Adams, took first in 5lap race quickly followed by Torq/Kona rider Marcos Schier taking 4th. 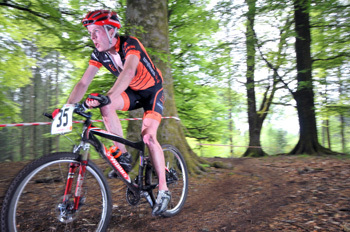 Martin Evans tapping it out in the singletrack in Drumlanrig. 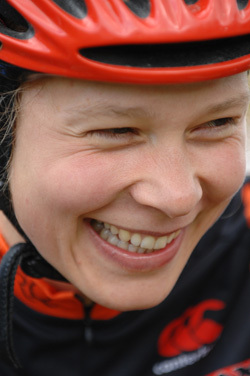 The Torq ladies were definitely on a roll with Lydia Gould picking up 1st in the women’s 4 lap race, while TORQ boss took a fine 3rd, just ahead of James D’Arcy in the men’s 4 lap race.